Scarf Material: 100% Premium viscose, warm in fall and winter, ventilated during summer. Scarf Size: 70.8″Lx35.4″W (180CMx90CM), soft and comfortable. 1.Used for wrap, shawl, scarf, beach cover up, head scarves, handbag accessories. 2.Popular for both adults, women, and teen girls. Multi-purpose accessories! 3.Nice long scarf with pretty floral, sewn from lightweight and soft viscose fabric, can be worn all year round in all weathers. 4.Shawl and wrap can be styled over the shoulder with any type of dress, blouse, sweater, sleeves, jacket, blazer or shirt for a charming modern look. 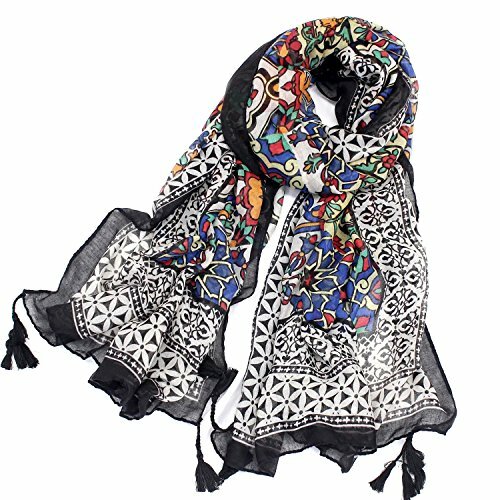 5.Feel smooth and soft when you touch this silk scarf, it is also gently and breathable, the elastic is excellent. 6.Nice long scarf with pretty floral, sewn from lightweight and soft viscose fabric, can be worn all year round in all weathers. 7.You can wear it as summer scarf for women or fall scarf for women or winter scarf for women. 8.Perfect for all occasions and seasons. Attend a party, or family travel, or go to work suitable for you in different occasions to wear. Ideal present for friends and relatives. 9.Gently hand wash with a neutral detergent or dry cleaning. Don’t wring, don’t keep direct exposure to the sun. 10.NOTE: Please wash before you first dress because there maybe exists a little floating color. But rest assured that it will be ok after your first washing. Here, you’ll find the perfect and most-wanted design for you or your family. We make our products with our heart, good materials, good workmanship. The length of scarf meets the standard you want. It is cheap and fine, and I’m sure you’ll like them. We promise to offer good quality products to make you satisfied. We make every effort to provide quality services. MATERIAL AND SIZE – Our women lightweight scarves are made100% premium viscose, warm in fall and winter, ventilated during summer. Size: 70.8″Lx35.4″W (180CMx90CM), soft and comfortable. ALL OCCASIONS AND SEASONS – Used for wrap, shawl, scarf, beach cover up, head scarves, handbag accessories. Lightweight and soft, easy to carry and great for traveling. Perfect for all occasions and seasons. Attend a party, or family travel, or go to work suitable for you in different occasions to wear. Ideal present for friends and relatives. 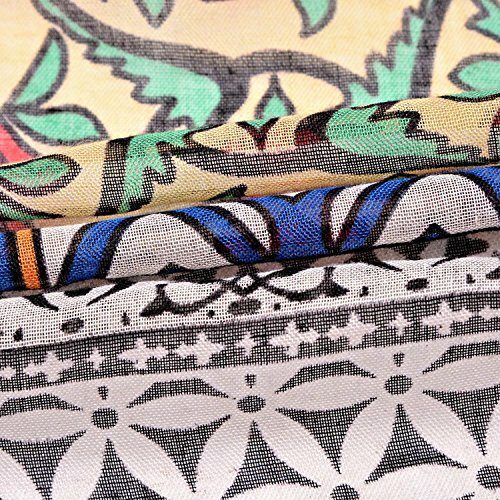 EYE CATCHING – Feel smooth and soft when you touch this silk scarf, it is also gently and breathable. Nice long scarf with pretty floral, sewn from lightweight and soft viscose fabric, can be worn all year round in all weathers. 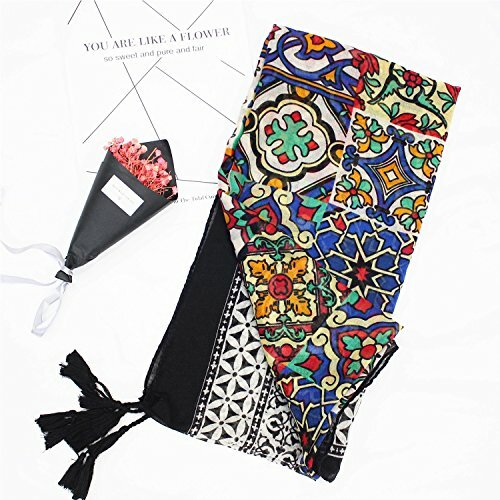 Stylish large scarf to you, eye catching. 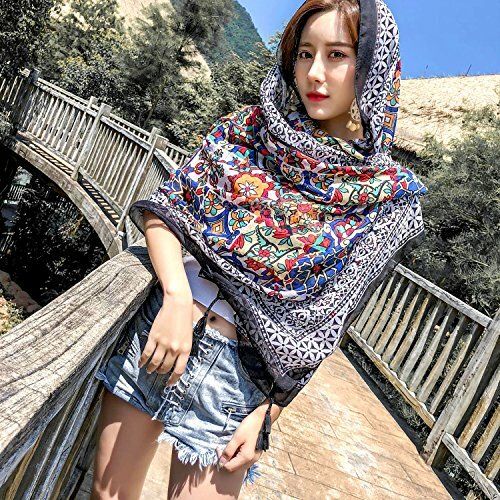 CHARMING MODERN LOOK – Trendy print silk Pashmina shawls can be styled over the shoulder with any type of dress, blouse, sweater, sleeves, jacket, blazer or shirt for a charming modern look. Popular for both adults, women, and teen girls. Good multi-purpose accessories! CARE INSTRUCTIONS – Gently hand wash with a neutral detergent or dry cleaning. Don’t wring, don’t keep direct exposure to the sun. NOTE: Please wash before you first dress because there maybe exists a little floating color. But rest assured that it will be ok after your first washing.